The customer is always correct, and this CRM tool from Microsoft both on-premises and in the cloud will ensure it remains that way. Customer Relationship Management (CRM) has become a necessity today as businesses, whether it’s small or big, has realised the significance of better relations with their clients. The good quality CRM software solutions enable businesses to flourish and generate more returns. It incorporates marketing and sales assistance techniques, along with improves customer support, especially decisive with medium and large-sized enterprises. Such category of companies may look for time-saving solutions that will permit them to carry out business and keep up contacts. The contacts can be of clients in progress or probable prospects along with maintaining information of new as well as old leads. To make CRM solutions more efficient, companies may consider using a diverse set of tools that will make their job even straightforward along with providing intelligence. One of the available solutions can be the Microsoft Dynamics CRM development. It can be tailored and installed on-premises and focuses on the most critical aspects of good CRM that we by now mentioned, that is Marketing, Sales, and Customer Service. Microsoft has even come up with essential innovative tools, such as Microsoft Dynamics 365, which is used in the cloud. It functions on applications comprising the Sales, Marketing, Customer Service, and also includes the Field Service as well as Project Service Automation. Dynamics 365 is the subsequent step in the advancement of a mutual ERP and CRM product. Microsoft’s vision is to have customisations on Microsoft AppSource. With Dynamics 365 customisation, creating ground-breaking solutions on an up to date, feature-rich and better quality technology stack is relatively straightforward. With enhanced techniques, enterprise solution offerings can deliver better services and while doing so, it can be more valuable to clients enabling them to mature with increased business opportunities. 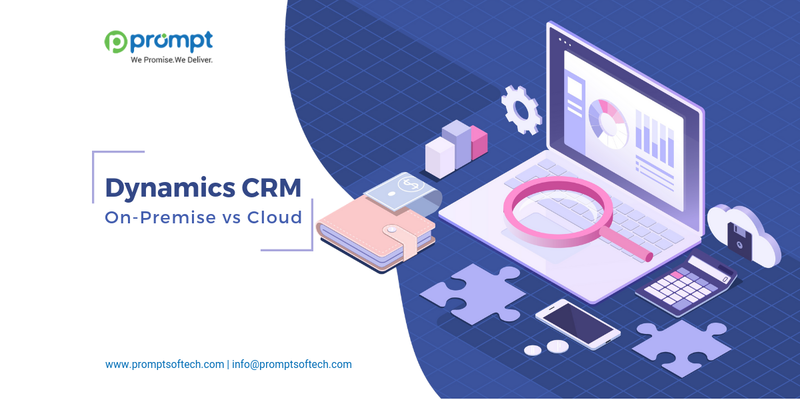 Microsoft Dynamics CRM on-premise is high quality and useful solution for organisations which values added independence and need better control over their list of services. CRM is hosted by the organisation itself or by its hosting partner which enables for greater integration and customisation of all required services. Here with this solution, even the users have added freedom in selecting when to have or run the necessary updates. The on-premise version also supports enablement of running old code which might not be workable with the newly hosted cloud solution. With hackers getting higher levels of unlawful access, your customer’s data is indeed at risk. While there are assortments of safety measures you could combat such issues, by just having on-premise software solution altogether is a better option. The on-premise solution brings in more safety and protection in opposition to cyber attacks. The other prime reason why Dynamics on-premise may have opted over Dynamics 365 is that its users don’t require an online connection to work on or have access to it. It can be a life-saving alternative, and sometimes even the cloud users are encouraged to install the on-premise version in case of future crisis. The organisations are themselves responsible for the costs of sustaining the hardware and the IT infrastructure which can turn expensive. Speaking of money, Dynamics on-premise users will also more often than not be likely to offer a single payment for the solution, without the selection for monthly fees. Microsoft Dynamics 365 is hosted in Microsoft's cloud which means the quite obvious benefit is that the users can have direct access to it wherever they are present and whenever they desire to. This enables professional colleagues to work on CRM remotely. It also provides more flexibility as CRM can be operated through different mobile devices, which includes a smartphone or tablet. Even, some of the functionalities and features are currently only obtainable in the cloud and not on-premises. The users can even have financial benefits as they can now pay based on their selected subscription model which more often than not entails monthly fees. What is more, the cloud solution means the organisation doesn’t require worrying about the costs linked to or involved with the hardware as well as for maintaining the necessary overall infrastructure like in on-premises basis. While cloud-based software has without a doubt taken centre stage, it doesn’t mean it’s the better option for your business. If problems such as security and control are anxiety for your organisation, then on-premise software will be your best selection. In the scenarios of data loss, Microsoft Dynamics 365 will be a precise solution to choose as it facilitates and allows for data backups as well as simpler and swifter recovery of data. In conclusion, both CRM software tools can be of assistance to establish and sustain better relations with your current as well as your old clients. However, with the boost in popularity and usage of cloud computing, organisations tend to look for direct online solutions for their accessed services. The businesses also turn to the cloud to save both their money and time. Microsoft Dynamics users who decide to migrate from on-premise to the cloud have a small number of choices for data migration solutions. We at Prompt Softech are a leading CRM development company India. Our pool of Dynamics 365 developers keeps up and elaborates hands-on expertise with the latest CRM technologies. The company augments its client’s with business process flow improvements, spontaneous customer insights, and reduces the overall complexity of enterprise solutions. Our project approach with Microsoft technologies starts with client consultation, test-driven development, user acceptance testing, project deployment, go live and finally continues the operations with support.